Domaine de Brin's Damien Bonnet This was quite some time ago, not really fresh news , but this small tasting event centered around the Gaillac wines has a timeless interest of its own. Terres de Gaillac is a group of a dozen vignerons from the Gaillac region, a little-known wine region of the south-west which is going through a promising rebirth, thanks to the relentless efforts of wineries like Domaine Plageoles and Causse Marines. The philosophy of the group is to favor a natural approach in the vineyard and in the cellar, and to make wines that are deeply rooted in the local tradition, particularly regarding the very unique grape varieties found almost only in this region. The tasting was set up june 11 in a restaurant named Youpi et Voila (managed by a former staff of Le Verre Volé). Causse Marines' Virginie was there too and it was nice to speak to her a minute (I visited her last winter). Great line of wines, with the sparklings, the still whites and the reds. I couldn't taste everything by lack of time that day but I was happy to discover the wines of Domaine de Brin. Damien Bonnet is taking the wheel of his family estate and he follows a nature philosophy in the vineyards as well as in the cellar, which I think you definitely feel in the liveness of his wines. The Domaine is located in the village of Castanet in the deep country of Gaillac north-west of Albi. His dry white Domaine de Brin Pierres Blanches 2010 had a nose with ripe aromas, the mouth had notes of ripe grapes with a pleasant acidity and a light, welcome bitterness. The red Domaine de Brin Anthocianes 2010 had an appealingly-fruity nose. The wine filled beautifully the mouth with a vibrant life feel when swallowed. Excellent wine. It's a blend of Braucol (an ancient local variety) and Syrah. The other red, Domaine de Brin Vendemia 2009 is more square somehow, will have to wait in the bottle I think before opening itself. Made from a local variety named Duras. Speaking of the sparklings of Gaillac, I recommend that you try the Mauzac Nature of Plageoles, we had several of them during the last months with B. (I don't remember if it was 2010 or 2011) and it was each time excellent. A rare wine experience This is about a bottle that slept in our fridge (the regular fridge, not the wine one) for years before we ended up drinking it. It's a 37,5 cl bottle of white wine, Chardonnay, that was given to me by Pierre Beauger when I visited him a couple years ago in Auvergne (eastern Loire). He told me at the time that it was a very special wine that had been through a very long winemaking, and I promised I'd take care of it. I always pushed back the moment to open it because I wanted to be ready for it, B. too, and I didn't want to rush that experience, knowing there was only one bottle here, and that this wine was not to be found anywhere on the market. The bottle was closed with a crown cap and when I opened it there was a little noise and almost like a vapor. This turned to be a little gem of a wine, a Chardonnay with a light oxydative nose and a purity in spite of the obvious residual sugar. Pierre had picked these chardonnay grapes in 2005 and left them dry in their clusters in an attic, out of the reach of rodents and other animals, like it's done for the Vin de Paille (this vinification type being only known in Jura and Hermitage). After a few months, the almost-dry grapes with their concentrated juice were pressed and the juice was entonné (poured into a barrel), after which it was kleft by its own, fermenting on-and-off over the course of 2 years until it found its place at last. It's devoid of any SO2, and Pierre Beauger had chosen this crown cap in case it decided to ferment again, as there was quite a good rate of residual sugar, but there was no bubbles at all in the wine, it was not even perly. The aromas were about dry figs or apricots, there was almost a sandy texture, like a sunny sort of tannin style which was very pleasant, and it kept telling you stories even after it was swallowed. A magic wine indeed, what you often get whith patience, time, and trust into what great grapes can turn into. Puzelat's micro cuvée of Pinot Meunier The other day in Saint-Aignan in the Loire, I walked into a shop named Le Comptoir de Louis (Rue Constant Ragot & rue du Four) which sits in the oldest building of the small town and I discovered that their wine selection was very interesting, to the point that they had a few bottled of a cuvée of Puzelat which I love : Le Rouge est Mis 2010. It's not the first time I write about this wine but I felt compelled to post about it again. This cuvée is made from a string of nearly abandonned parcels of Pinot Meunier located in the region of Orléans, and which Puzelat vinifies with the help of a non-profit group which takes care of the vineyard management, the goal of the whole thing being to keep these small parcels (which make sometimes only 3 rows each) which are part of the local Heritage from being uprooted. The wine was at 11 € if I remember and I bought a bottle to drink it the same weekend with friends. This light-colored and turbid wine was as usual a treat, a savoury mouth with silky fruit and such an easy swallowing that I almost regretted to share it (I'm kidding). This shop sells lots of different stuff like rare tea, honey, creams and a string of Japanese whiskies. A Pinot Meunier from Orléans In the same register, we had recently a bottle of Orléans AOC (again, link to Richard Kelley's great resource), a little-known appellation created in 2006 with a small planted surface. 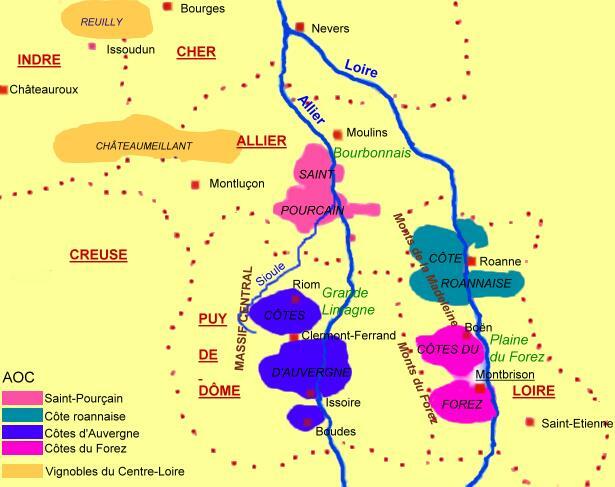 The wine is made by the coop of this small wine region which goes under the name of Les Vignerons de la Grand' Maison. This red is made with a majority of Pinot Meunier, the label says, but it's not clear if it's a majority or, say 40 % plus 3 other varieties making 20 % each. I found on the Web a page saying it was 80 % Pinot Meunier and 20 % Pinot Noir. The wine was pleasant to drink with a chewy fruit although there's this sugary feel in the mouth that you find everywhere nowadays. Overall a good deal, especially that I found that bottle for 4 € only, it was on the shelves of the Super U supermarket in Saint-Aignan-sur-Cher. I guess they don't have a large production because this wine is from my impression rarely seen outside the region. I had tried a couple years ago the red Orléans of the reference estate in the area, Clos Saint Fiacre, but the bottle (which cost 11 €) was spoiled for some reason and undrinkable. I got to try again because this region is still under the radar and the front seat given to Pinot Meunier will give them a definitely-different style. It seems that Ukraine is determined to fight moonshine, or Samogon, like it's named in Russia & Ukraine. Here is another press invitation by the police of Zhitomir, to show the good work and all the hell tools they seized in their surprise raids. Heavy fines have been imposed to the owners of these illegal micro distilleries which were confiscated in farms and housing complexes. The comments under the story are quite skeptical and ironic, one commenter saying that the constitutional property rights of the peasants are violated here. Among the possible reasons behind this photo-op, there's the will of Ukraine to show the E.U. that it does its best to get in line with European norms on this issue. The issue of the extremely bad quality of much of this moonshine is also central, many crimes resulting from the trafic and consumption of this cheap booze. Here is a picture of one of these artisanal micro-distilleries, with the boiler on the left (apparently on a wood stove), the horizontal cooler in the middle and the dropping moonshine filling a bottle on the right. Link to the original article (lots more pictures, I'm sure you guys will find tips for ingeniously improvise your own moonshine lab...) Belarus Police posing in front of an improvised alambic Police in the Dubrovno District of Belarus is also on the front of the fight against Samogon. Moonshine vodka is hard to uproot as it's so much part of the tradition in Belarus too (like in Russia & Ukraine), but the related rise in crimes and their consequent casualties forced the authorities to cool down this kitchen business. To help locate the moonshine hot spots, the administration has set up a hot line through which concerned citizens can report the location of an illegal samogon workshop. Still, there are dozens of websites like this one or this other one (they're Russian but everyone speaks Russian in this part of the world) where moonshine (or samogon making) is explained from A to Z. Like always, the police is targetting the bad guys who make unhealthy spirits, but Samogon can be great if well made from good products. This all reminds me how I was right to say that Russia is inherently focused on organic, it's in their genes and without the bobo or fashionable side of it. La Diablesse 2004, Chateau de Coulaine Kudos to Etienne de Bonnaventure of Chateau de Coulaine in Chinon (Loire) for this wine : La Diablesse 2004 was a bit of mystery before I tasted it, I didn't know about the domaine and the label was intriguing (the artist behind it is Madlem Herrström) . All right, I recognize that the back label compelled me to try it : printed in a hand-written style, it said among other things Vin Naturel and unfiltered. This wine happened to be just delicious : a deep fruit with a silky texture and an onctuous touch in the palate and swallowing. Very nice, another bottle that goes down without noticing. this is 100 % Cab Franc from vines aged 40 to 80. 18-month élevage in old casks in the cold cellars of the chateau. Here is the cuvées page of the domaine. The wine can be found in Paris at La Contre Etiquette in the 10th for 22 €. Overwhelmed This is what I saw a few weeks ago near the hotel Lutetia on boulevard Raspail in the 6th arrondissement. It's quite common to see these recycling containers in Paris surrounded by a sea of empty bottles. Given the location of this particular one near the Lutetia, i doubt that the reason is a sudden influx of bums drinking cheap booze in the small garden nearby. Rather, there's an inertia on the part of the city administration which is responsible for the glass-collecting trucks and the frequency of their turns. The Paris administration being supposedly co-managed by the Greens, it would make sense that people making the effort to bring their bottles to the recycling containers don't feel a complete disinterest in their "action citoyenne", to paraphrase the favorite newspeak of these politicians... A home-bottled Sauvignon 2008 A couple weeks ago in the Loire, I found a bottle of Sauvignon that I had bottled myself years ago, I do bottle bulk wine from time to time, here I had bought 10 liters of wine at André Fouassier, a vigneron of the region, he's making interesting wines in the Valençay and Chabris region, Chabris being celebrated by André Julien in 1816 (a respected wine writer then) along with Reuilly for the quality of its white wines (see on the History chapter of this page). His sparkling is also a good deal at 4,3 € a bottle and B. and I use to stock our bubbly there. This Sauvignon 2008 was I think my last bottle of this batch and I decided to resume these bulk & bottling moves because not only they're cheap (maybe 1,3 € a liter) but the wine was a good surprise. As I just rinse the bottles and don't use chemicals to keep the bottle germs free, I had a couple of bottles which were a bit fizzy if I remember but that's not a problem for me, I grab a still wine and find myself with a sparkling, why not ? This one didn't have any perly default and I recognized André Fouassier's style in his whites with this light oxidative side and steady minerality which makes his wines very pleasant. Digging into my mess in the Loire I found also two bottles of Fouassier, both being from what I know a Chard-Sauvignon blend with a majority of Sauvignon (not bottled by myself). The first, a 2006, was a very nice surprise, here also this rich, generous feel with a hint of oxidative notes. the mouth was balanced and the alcohol was kept in check by the minerality/acidity couple. The other was even older, it was a Valencay 2004 from the same domaine, this one was good but maybe more heavy compared with the 2006. I told André Fouassier about these uncovered bottles and he told me he was a fan of his 2004 which he thought better than his 2006. I've got to dig a little more about these forgotten terroirs of Chabris. I leafed digitally through the google books pages of André Julien's book named Topographie de Tous les Vignobles Connus, it's a mine of information that gives you a quasi-photographic profile of the vineyards and wines of that time (around 1816), not only in France but in many parts of the world... Cours Belsunce, Marseilles A restaurant owner who has been working in Marseilles for 30 years has been threatened, then violently attacked because his restaurant was open during the Ramadan. The victim who is not muslim was approached by a lone man (accompanied by a veiled woman) and ordered to close his snack restaurant "in respect to Ramadan". One hour later the man came back and hit the restaurant manager with a metal belt, causing injuries. The place where this happened was not one of these self-segregated muslim ghettos north of Marseilles, where these supremacist moves are routine. Cours Belsunce is an old classic boulevard near the port (vieux port), a postcard symbol of easygoing Marseilles. That may be what worried the French domestic intelligence agency (RG) who sent someone to interview the victim and try to identify the perpetrator. Pretty late wakeup, guys. This type of violent behaviour against people drinking, smoking or eating in France during Ramadan has multiplied over the last few years without too much scrutiny from the part of the administration, but they are the norm south of the Mediteranean where this "crime" lands you in jail. Adding up to a long list of violence including countless attacks on jews all over France, this makes quite a lot of hate for a supposedly-peaceful religion. I'm afraid we can expect more similar niceties in the future here, possibly also regarding wine shops or convenient stores selling booze. Relatedly, in self-destructing Tunisia, the last working bar of the town of Sidi Bouzid was ransacked by islamist bigots. A recent post by Antonin on his blog pointed to a recent study where you learn that regular wine drinkers in France get an overdose of sulfites on a daily basis. The study (Pdf) made by the Agence de Sécurité Sanitaire looked into the food safety regarding in particular a list of additives used in the food and beverage industry. The researchers there found that 3% of adults get a dose of sulfites which is above the maximum daily dose (dose journalière autorisée), and these 3% of adults are precisely the part of the population who drink wine and other fermented beverages every day. Looking at the page 10 of the Pdf document, I note that the corrective action considered by the agency is "réduire la consommation de vin et de certaines boissons alcoolisées" or reduce the consumption of wine and other alcoholic beverages. It is astounding that a scientific study ignores the issue of heavily-loaded versus sulfur-free wines; it would make more sense to consider orienting the wine consumers toward wines with low-or-no added sulfites. We also learn that the OMS advises not to have daily intakes of sulfites over 0,7 mg per kilogram of body weight, meaning that if your weight is 70 kg you must not consume over 50 mg of sulfites per day in your food or drinks. And the state statistics agency Insee found that more than one million Frenchmen receive higher doses, these are 2,5 % who drink the most wine... And you don't need to be alcoholic to reach this sulfites overdose : 20 to 25 cl of a wine which has been heavily-loaded with SO2 is enough to get you daily allowance blasted. Sulfites have many negative health consequences including heart rhythm disorders. I notice sometimes visitors connecting to Wineterroirs with google search words like "merlot heart beating fast" or something like that. Someone obviously has noticed (like in this story) that his heart begins to race after a single glass of his favorite wine, and he thinks a particular variety is the cause, because some other wines, happening to be from a different variety don't bring the same consequences on his heart rhythm. I've got several visits on this theme, proving that the unsuspecting consumers think wrongly that a particular type of wine is the cause, when in fact a hidden additive may well be behind his health problem. The real reason of these disorders seems to be the high sulfites doses in the wines, as sulfites' allergic side effects include heart-rhythm disorders, but doctors usually ignore the huge gap between the different sulfites doses in wines and advise people with these symptoms to stop drinking wine or alcohol right away. This eHow page on heart palpitation & wine doesn't seem to list sulfites as the prime responsible for these disorders. On the other hand, this page from Huffpost on wine intolerance addresses the issue of sulfites (and not wine by itself alone) being the cause of certain intolerance and heart disorders. This poster was hanging in Jeremy Quastana's cellar. Here is a poster that had been printed widely in the early 1900s', one among a series known under the name panneaux mureaux Armand Colin, these were thick cardboard posters which you could see hanging in the French primary schools. They were very efficient at the time, impressing the young minds with clear images and a scientific approach of many issues, this one featuring the health consequences of alcoholism including in the face and unkept demeanor of of the doomed individual, and setting a clear line between the "Good" booze(wine or beer) and the "Bad" (industrial alcohol made from beet or potatoes). This poster, which was designed by Dr Galtier-Boissière [conservateur des Collections Scientifiques Musée Pédagogique de l'Etat], deals about the dangers of alcohol, but our modern puritan-censors would be enraged, as the poster makes a distinction between the "good natural beverages" (boissons naturelles bonnes) like wine, cider, poiré and beer, and the "bad industrial alcohol" (alcools industriels mauvais). The debate then was not already something like natural wines versus additives-corrected industrial wines, the industrial alcohol finger-pointed here being the hard spirits made with potatoes, beet and wheat or other grains. Look at the hilarious experience on a guinea pig : after drinking wine, the animal lies on the side "feeling intoxicated" [ressent un accès d'ébriété would better translate as "feels high"]. Under the 3rd image you can read "the intoxication effect soon vanishes without consequences" (L'accès est bientôt dissipé et ne laisse aucune trace). The animal is struck by an epileptic seizure. The last image read : the guinea pic dies shortly after. These old school posters are an informal way to visualize how all these things and issues were perceived then; alcoholism was a wider phenomenon compared with today and many men fell prey to this social scourge. A guinea pig getting high Isn't this cute to see this guinea pig enjoying its natural wine ? I say natural wine because the expression Effets du Vin de Raisin means something like "effect of the wine made with grapes only". and also because I'm pretty sure that the type of wine that were drank around 1900 locally in the French provinces was an innocent and easily digestive wine sporting something between 8 ° and 10 ° in alcohol, these were wines that apart a possible chaptalization (although sugar was expensive back then) were true wines. I thoroughly enjoy your blog. It makes me sad though that you get to experience these wonderful wine adventures and people like me do not. I have good access to nice wine here in the US but it cannot compare to the 2000 year old culture that France gets to enjoy. Maybe someday I can partake. Cheers! where can i buy or get the info about these wine/burgund glasses? There are different types of glasses on this page, which one are you talking about ?